When High Dynamic Range (HDR) images first came on the scene, many people thought they looked unreal though beautiful. For years, HDR photographers and software companies worked to make the images look realistic with much success. When I went to the eastern shore of Lake Ontario last week, the scene was very flat looking. Dark skies over dark water with a small color pallet in the blue end of the spectrum. I processed a set of photos covering the light range from -2EV to +2EV into the HDR image you see below. HDR image of a cloudy sunset from Brennan Beach RV Park & Campground on Lake Ontario near Pulaski, New York. Nikon D700/24-120VR, f/22, ISO 200, EV 0, 24mm focal length, tripod. This image is far from what the actual scene looked like. 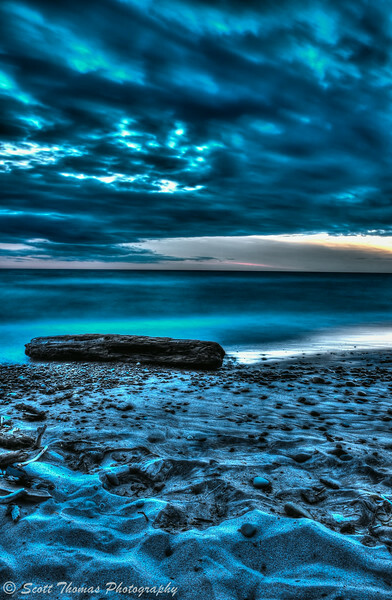 To my creative mind, it is how I felt when standing on lonely beach looking out over Lake Ontario at sunset. This entry was posted in Weekly View and tagged 24-120mm, beach, clouds, creative, dusk, hdr, horizon, Lake Ontario, log, long exposures, new york, nikon D700, photomatix, rocks, sand, summer, tripod, vr, water. Bookmark the permalink. I think this has a fantasy-like feel to it – like you visited a beach on another planet!